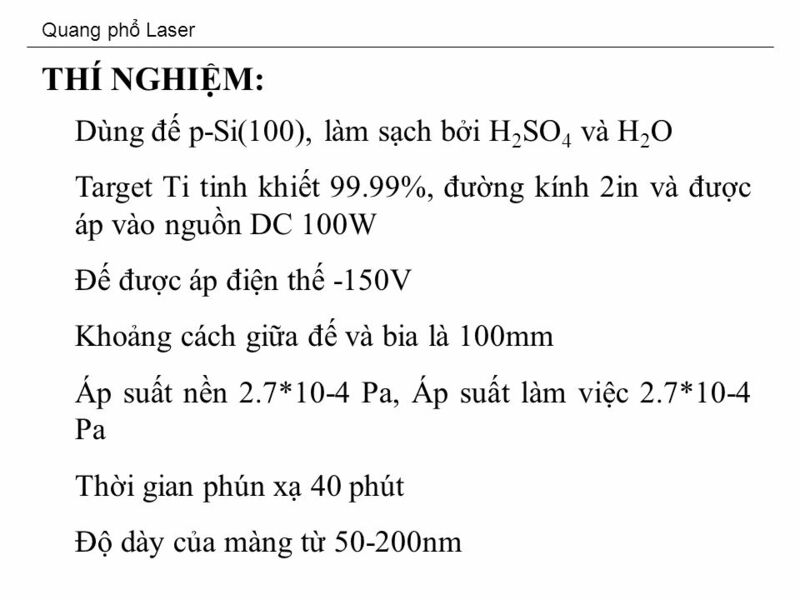 Quang ph Laser DÙNG PH RAMAN VÀ PH QUANG PHÁT QUANG NGHIÊN CU NH HƯNG CA T L KHÍ OXY VÀ S NHIT ĐI VI MÀNG TIO 2 CH TO BNG PP PHÚN X MAGNETON PHN NG. 9 GIXRD patterns of titanium oxide lms formed at: 3, 6, 10 and 15 FO2% and post-annealing at 750 °C for 2 min in air RESULTS AND DISCUSSION _ The deposition time was xed at 40 min. _ The crystalline (101) anatase peak denoted as A(101) at 25,3°. 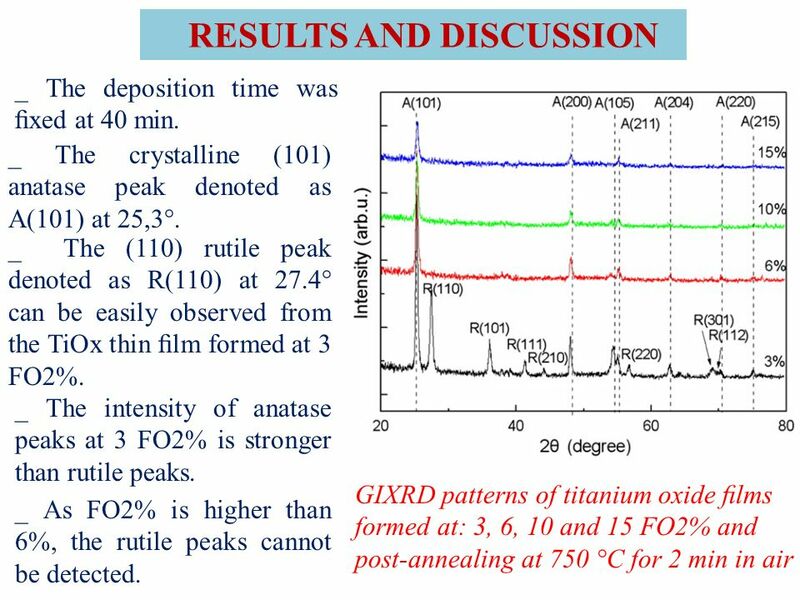 _ The (110) rutile peak denoted as R(110) at 27.4° can be easily observed from the TiOx thin lm formed at 3 FO2%. _ The intensity of anatase peaks at 3 FO2% is stronger than rutile peaks. _ As FO2% is higher than 6%, the rutile peaks cannot be detected. 10 GIXRD patterns of titanium oxide lms formed at: 3 FO2% and post-annealed at RT, 350°C, 550°C, and 750°C for 2 min in air. 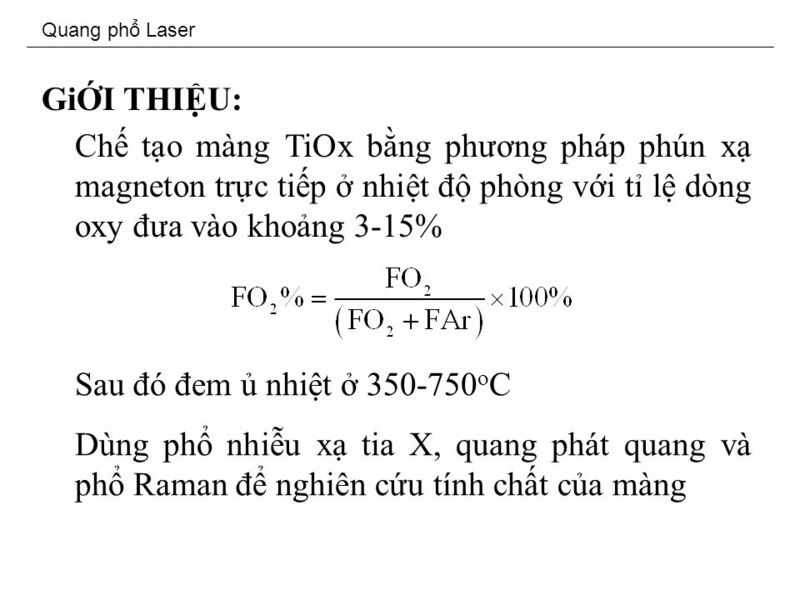 RESULTS AND DISCUSSION _ TiO x lm annealed at 350°C is still an amorphous lm because of no distinct diffraction peak. 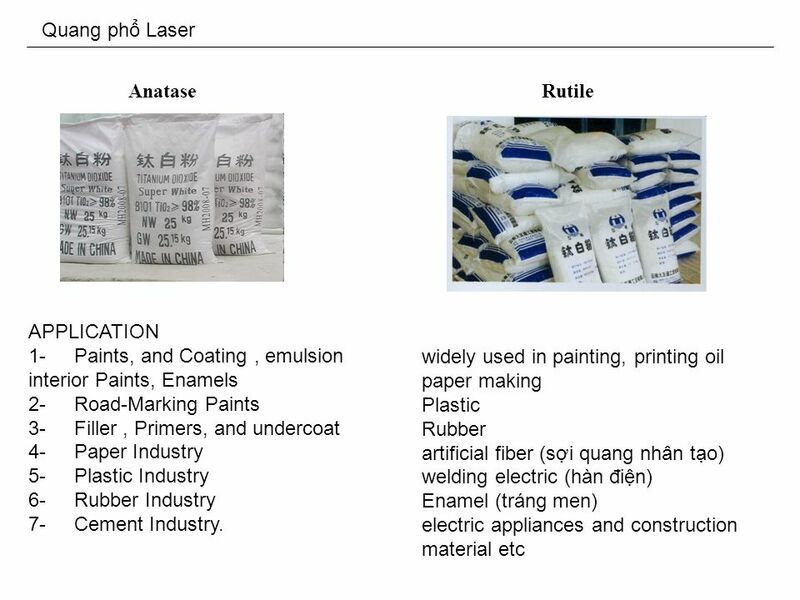 _ The mixed crystalline anatase and rutile lms are obtained after 550°C and 750°C annealing. _ The intensity of both anatase and rutile peaks increases with increasing temperature. 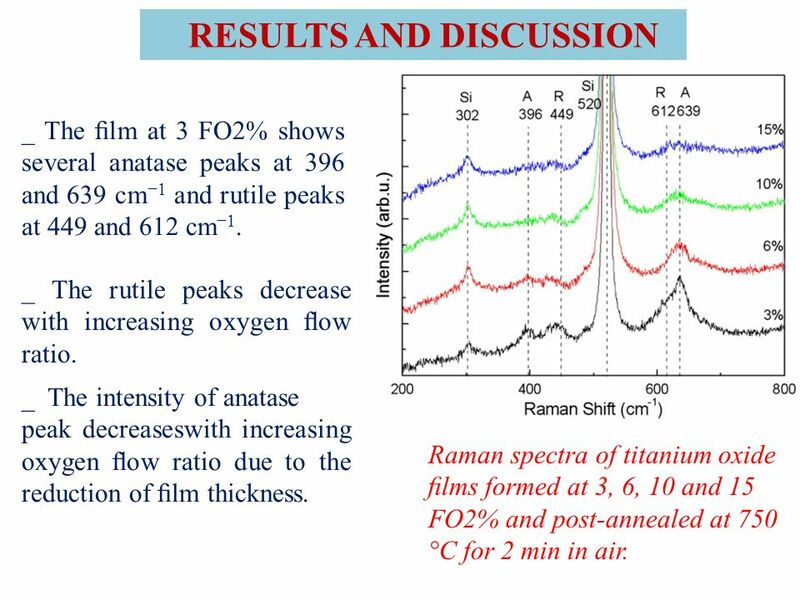 11 Raman spectra of titanium oxide lms formed at 3, 6, 10 and 15 FO2% and post-annealed at 750 °C for 2 min in air. 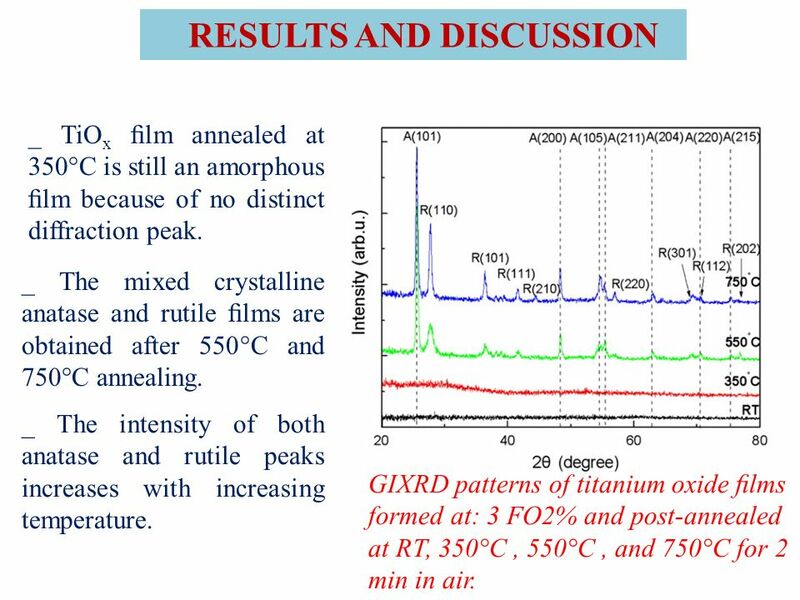 RESULTS AND DISCUSSION _ The lm at 3 FO2% shows several anatase peaks at 396 and 639 cm 1 and rutile peaks at 449 and 612 cm 1. _ The rutile peaks decrease with increasing oxygen ow ratio. _ The intensity of anatase peak decreaseswith increasing oxygen ow ratio due to the reduction of lm thickness. 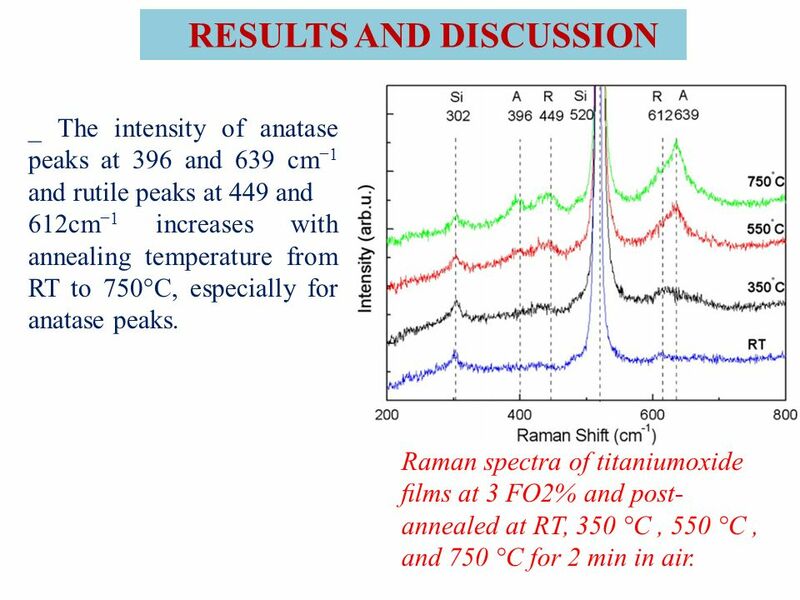 12 Raman spectra of titaniumoxide lms at 3 FO2% and post- annealed at RT, 350 °C, 550 °C, and 750 °C for 2 min in air. RESULTS AND DISCUSSION _ The intensity of anatase peaks at 396 and 639 cm 1 and rutile peaks at 449 and 612cm 1 increases with annealing temperature from RT to 750°C, especially for anatase peaks. 13 PL spectra of titanium oxide lms formed at 3, 6, 10 and 15 FO2% and post-annealed at 750 °C for 2 min in air. 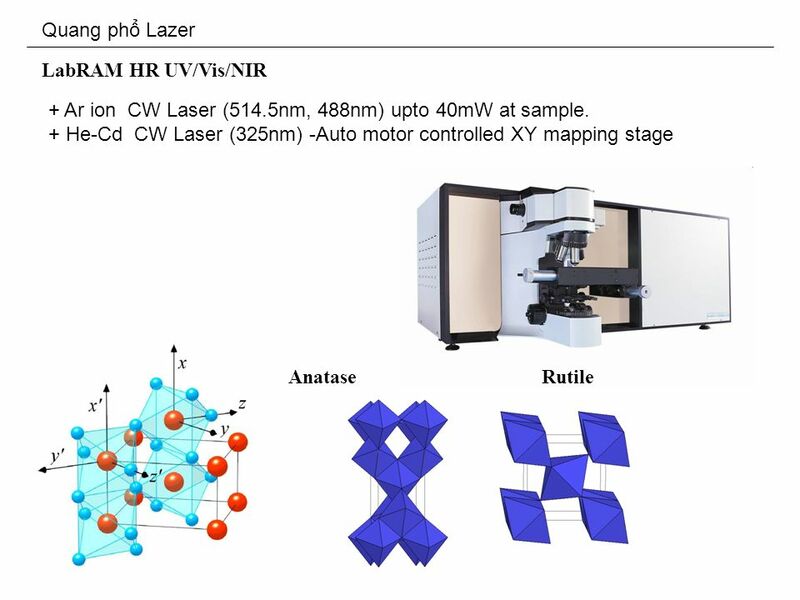 RESULTS AND DISCUSSION The relationship between the crystalline structure and PL behaviors of titanium oxides Laser excitation: 325 nm, at the room temperature _ The weak shoulder peak at 650 nm is induced from the laser source. _ An asymmetrical wide FWHM peak in visible region is observed at the 3 FO2% sample. 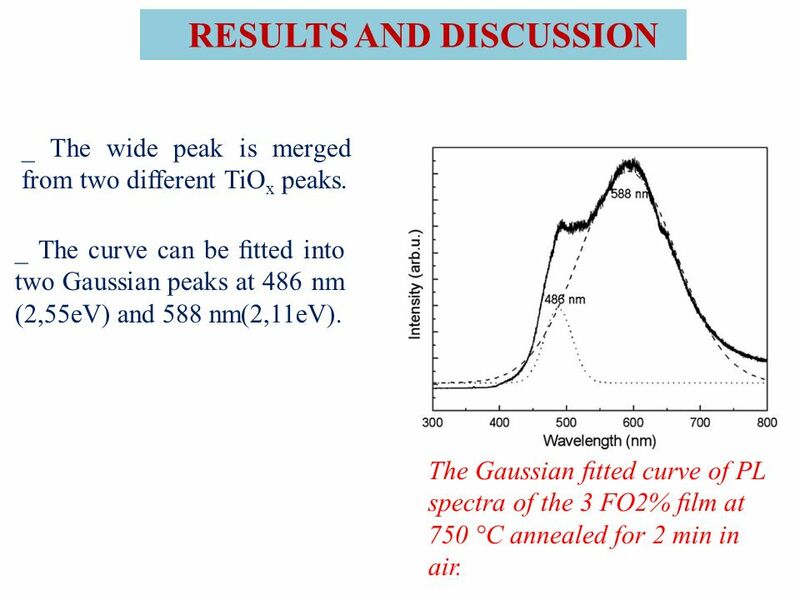 14 The Gaussian tted curve of PL spectra of the 3 FO2% lm at 750 °C annealed for 2 min in air. RESULTS AND DISCUSSION _ The wide peak is merged from two different TiO x peaks. _ The curve can be tted into two Gaussian peaks at 486 nm (2,55eV) and 588 nm(2,11eV). 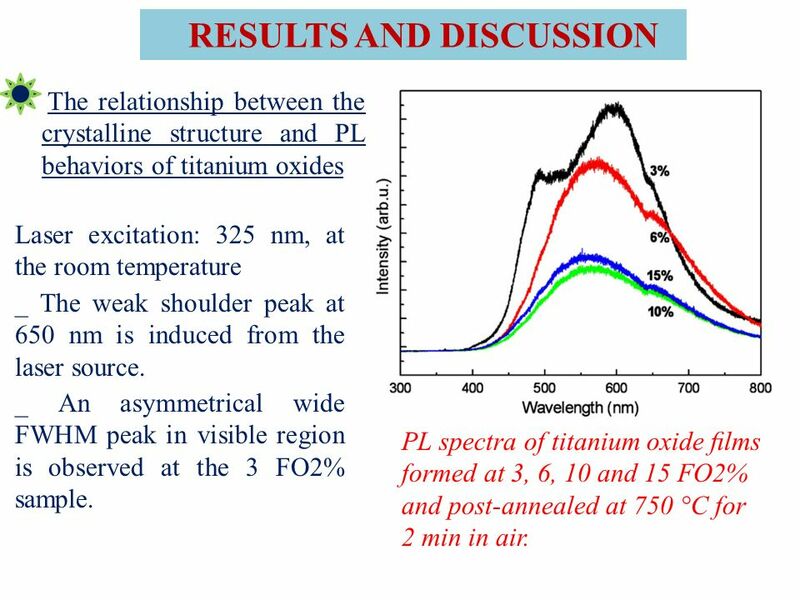 15 PL spectra of titanium oxide lms at 3 FO2% and post-annealed at RT, 350 °C, 550 °C, and 750 °C for 2 min in air. 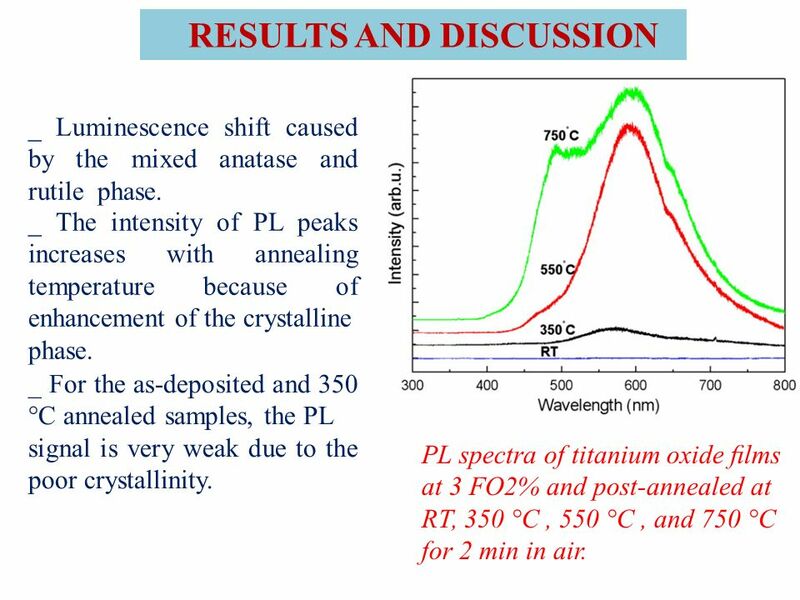 RESULTS AND DISCUSSION _ Luminescence shift caused by the mixed anatase and rutile phase. _ The intensity of PL peaks increases with annealing temperature because of enhancement of the crystalline phase. _ For the as-deposited and 350 °C annealed samples, the PL signal is very weak due to the poor crystallinity. 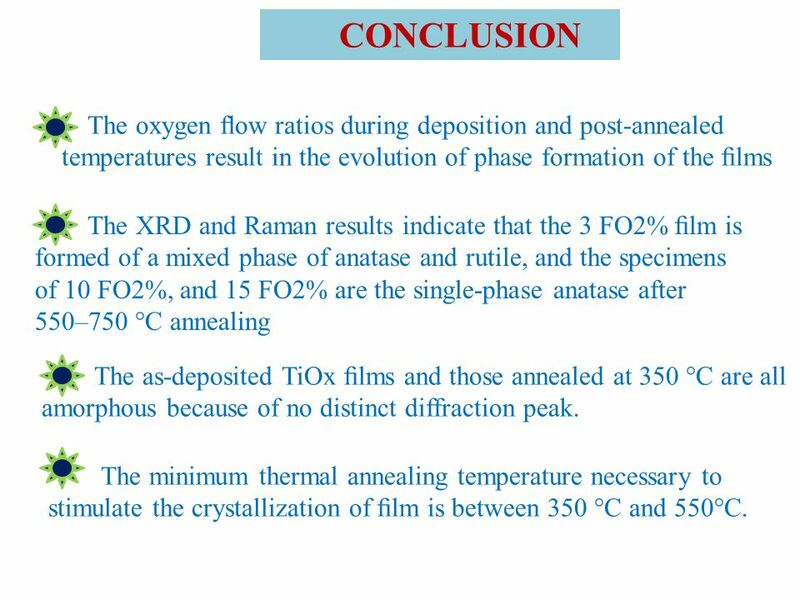 16 The oxygen ow ratios during deposition and post-annealed temperatures result in the evolution of phase formation of the lms CONCLUSION The XRD and Raman results indicate that the 3 FO2% lm is formed of a mixed phase of anatase and rutile, and the specimens of 10 FO2%, and 15 FO2% are the single-phase anatase after 550–750 °C annealing The as-deposited TiOx lms and those annealed at 350 °C are all amorphous because of no distinct diffraction peak. The minimum thermal annealing temperature necessary to stimulate the crystallization of lm is between 350 °C and 550°C. 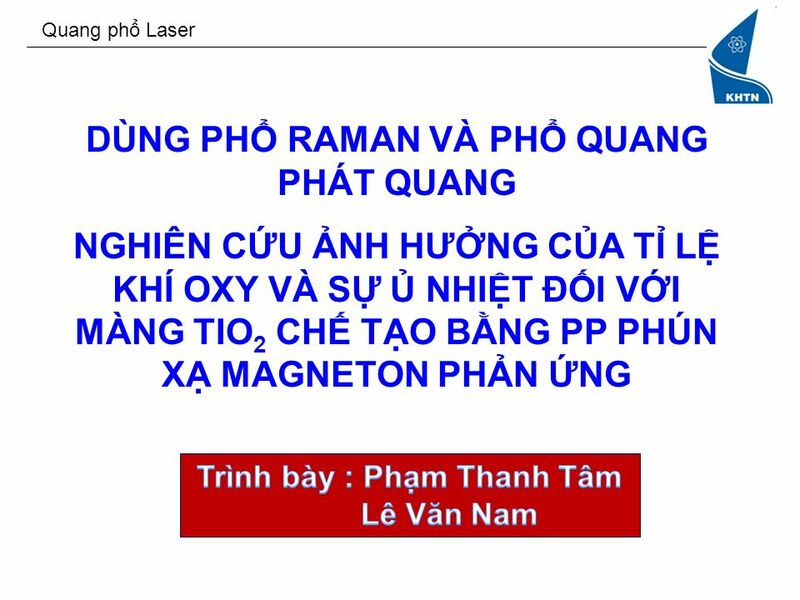 Download ppt "Quang ph Laser DÙNG PH RAMAN VÀ PH QUANG PHÁT QUANG NGHIÊN CU NH HƯNG CA T L KHÍ OXY VÀ S NHIT ĐI VI MÀNG TIO 2 CH TO BNG PP PHÚN X MAGNETON PHN NG." Experiments about carbon removal and codeposit inhibition J.A. Ferreira, F.L. Tabarés, W. Bohmeyer and A. Markin, I. Tanarro, V. Herrero. WZI seminar Si nanocrystals as sensitizers for Er 3+ PL in SiO 2 M. Wojdak Van der Waals - Zeeman Institute, University of Amsterdam Valckenierstraat. Study Skills- Chapter 10 & 11 PREPARING and TAKING EXAMS. Environmental Dependence on Tribological Behavior of Diamond-like Carbon Films with Nano-undulated Surface Jin Woo Yi a,b, Se Jun Park a, Kwang-Ryeol Lee. Metal-free-catalyst for the growth of Single Walled Carbon Nanotubes P. Ashburn, T. Uchino, C.H. de Groot School of Electronics and Computer Science D.C.
Hydrothermal Processing of Ba X Sr (1-X) TiO 3 Presented By: Adam Chamberlain Advisors: Elliot Slamovich Mark McCormick. 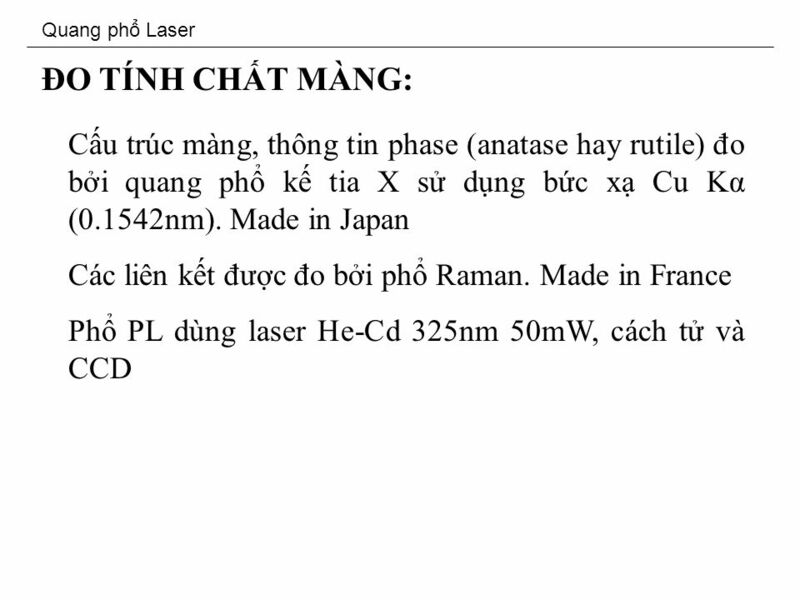 Chương 12 ĐIỆN HÓA HỌC. Cu 2+ (dd) + Zn(r) Cu(r) + Zn 2+ (dd) Cu 2+ (dd) + Zn(r) ⇌ Cu(r) + Zn 2+ (dd) Zn - 2e - ⇌ Zn Cu e - ⇌ Cu Chất. Spectroscopy of Hybrid Inorganic/Organic Interfaces Vibrational Spectroscopy Dietrich RT Zahn. STRUCTURAL CHANGES STUDIES OF a-Si:H FILMS DEPOSITED BY PECVD UNDER DIFFERENT HYDROGEN DILUTIONS USING VARIOUS EXPERIMENTAL TECHNIQUES Veronika Vavruňková. 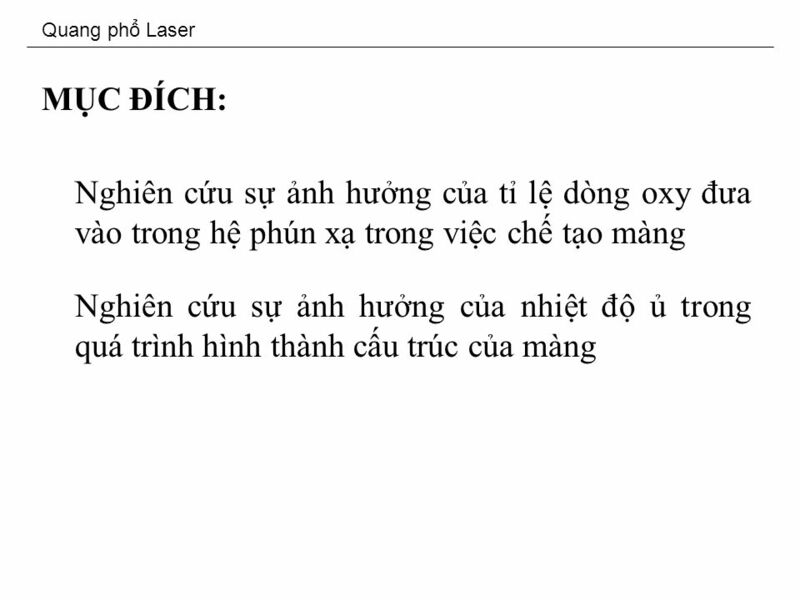 Study Skills- Chapter 6 “Th ờ i gian th ấ m tho ắ t thoi đ ư a Nó đi đi mãi, có ch ờ đ ợ i ai!” (Ca dao) Tin x ấ u: th ờ i gian c ứ bay mãi. Nh ư ng tin. BÀI 3. ĐƯỜNG THẲNG VÀ MẶT PHẲNG SONG SONG SỞ GD&ĐT ĐIỆN BIÊN TRƯỜNG THCS-THPT TẢ SÌN THÀNG BÀI DỰ THI SOẠN GIẢNG E-LEARNING Chương II ĐƯỜNG THẲNG VÀ MẶT.